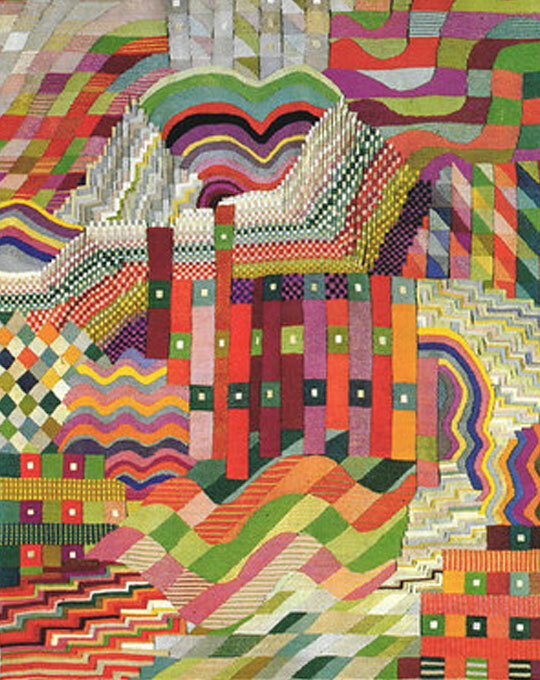 Having followed a thread to the past and seen how textiles have served as items of form and function (with function gradually taking over), I want to take a look at some female artists I’m calling ‘The Fibregettes’; five pioneers who I feel liberated textiles in art. To artists working in textiles, Sonia Delaunay (1885-1979) is an early star who played an important role in bringing textiles into the avant-garde movement. Sonia and her husband, French artist Robert Delaunay, championed ‘orphism’, an adaptation of cubism that emphasized form, colour, and rhythm. She’s quoted as saying “About 1911 I had the idea of making for my son, who had just been born, a blanket composed of bits of fabric like those I had seen in the houses of Russian peasants. When it was finished, the arrangement of the pieces of material seemed to me to evoke cubist conceptions and we then tried to apply the same process to other objects and paintings”. Delaunay was the first living female artist to have a retrospective exhibition at the Louvre in 1964. She has also had her work shown at Musée d’Art Moderne in Paris, Smithsonian Cooper-Hewitt, National Design Museum, Musée des Arts Décoratifs, Musée National d’Art Moderne and Tate Modern. Born in 1897, Stolzl is a highly influential figure in the development of the Bauhaus style. She joined as a student in 1920, when the textile department of the Bauhaus was somewhat neglected. She quickly became a mentor to other students, was responsible for reopening the dye studios in 1921, became a junior master in 1927 and a full master the following year. On becoming Weaving Director in 1925, Stölzl developed a curriculum which emphasised the use of handlooms, gave training in the mechanics of weaving and weave techniques and dyeing skills, and arranged for classes to be taught in mathematics and geometry (glad I didn’t have to take that!). She considered the workshop a place for experimentation and encouraged improvisation, including exploiting the properties of fabric, particularly the newly available synthetic fibres. Under her direction the Bauhaus weaving workshop became one of its most successful facilities, but in 1931 Stolzl had to move in order to avoid the situation in emerging Nazi Germany. In Switzerland, she formed several textile companies but eventually left her hand weaving business inorder to devote herself to tapestry and the weaving of her own designs. I love their pure, graphic simplicity, all still relevant today. Often in the shadow cast by her husband, Josef Albers, Anni Albers remains one of the most influential artists and makers working with textiles. She studied at the Bauhaus during its most impoverished years and after finishing the foundation began working in the weaving workshop, going on to revolutionise the medium with her experimentation and modern design. She also understood that the Bauhaus needed to create designs that could be industrially manufactured and whilst always committed to the handloom, she also considered how the output could work in production runs. Mounting pressure from the Nazi party threatened the Bauhaus in 1931 and both Anni and Josef Albers were hired at Black Mountain College. Josef taught a range of art classes and Anni led the weaving and textile design program until 1949 (Sheila Hicks was a student, but more of her later). She continued to design cloth for mass-production whilst producing artworks on the handloom. 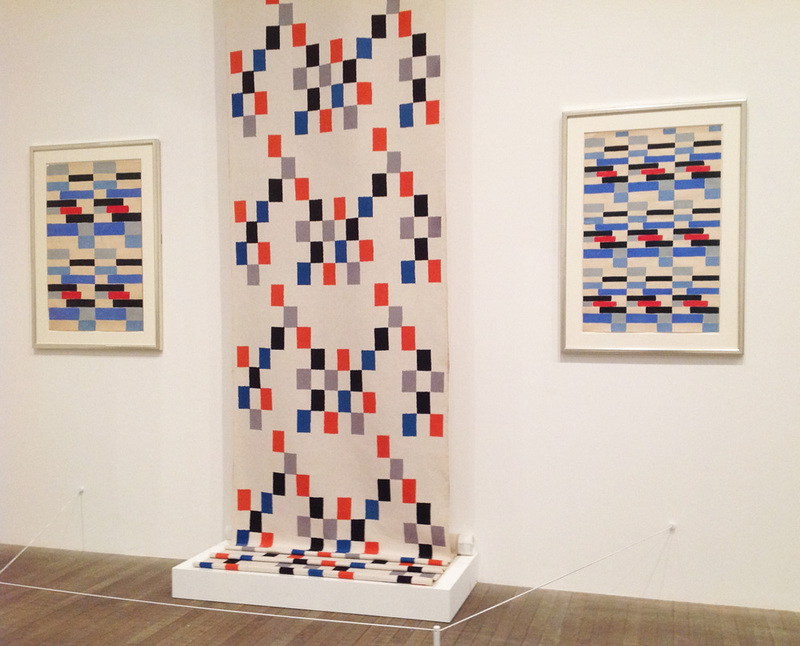 I feel that part of her distinctive style is the textural quality of her weavings, both in a literal and visual sense. In 1949, the Museum of Modern Art, New York exhibited Albers' work, making her the first designer to have a solo exhibition there. A retrospective of Anni Alber’s work will be shown at the Tate Modern from 11th October 2018 to 27 January 2019. Louise Bourgeois is well-known, particularly after Maman, the giant spider, became a favourite place to meet outside the Tate Modern. In her early career she focused on painting and printmaking, turning to sculpture in the 1940s. Her themes were of loneliness, jealousy, anger, and fear and were realised in different forms, materials and scale; sometimes figurative, sometimes abstract. Bourgeois grew up with parents who ran a tapestry restoration business, helping out in the workshop by drawing missing elements in the scenes depicted on the tapestries. As such, it’s not surprising that in her later years she returned to textiles, including a range of textile works made from old clothes and several ‘fabric books’ constructed from her huge collection of fabrics. The pages of these books incorporate a range of techniques including appliqué, embroidery, tufting, rolling quilting, weaving and layering. During this period she constantly made drawings on paper and also returned to printmaking. Borgeois said that “art is a guarantee of sanity”. It was her way of coping with and living in the world. Hannah Ryggen was born in 1894, in Malmö, Sweden and was one of Scandinavia’s most outstanding artists of the 20th century. She spent six years as a painter’s apprentice before deliberately turning to weaving. With no running water or electricity, Ryggen worked from concept to materials production to completion of her tapestries: she spun wool from her own sheep, and dyed it with local plants. Her loom was homemade and she wove without cartoons or drawings – straight from images she saw in her head. Her output was far from traditional and usually a narrative or comment on social or political happenings of the time. ‘Woven Histories’, an exhibition at Modern Art Oxford showed a line-up of those involved in political skulduggery; Hitler, Göring and Goebbels to name but a few. She tackled the rise of fascism within Ethiopia and the Nazi occupation of Norway. Lyndon B Johnson’s beagle – something Ryggen considered to be a media distraction from the Vietnam war – was also included. For me, the results are owerful and moving, a testament to someone who was engaged with the world, had something to say, who was committed to her message and committed to her art. Having departed from this world, none of these artists have websites! An online search will yield more information and images if you want to dig deeper. Claire Benn is an artist who works with mixed media and textiles. She is also an author, curator and teacher in Art Textiles.